The Smartcard Focus proof of concept kit contains everything you need to implement PKI-based smartcard logon on your Windows server and domain. It enables you to evaluate different hardware and software options, and to try out different approaches to managing your cards and users, prior to a wider deployment. If you are operating a standard Windows server/domain environment, then you already have all of the core software components required to implement secure two-factor logon for your users. User names and passwords are replaced by smartcards and PINs � something you have, and something you know. A user�s smartcard generates a private key, protected by the PIN, and also stores a digital certificate, issued by the server. When a smartcard reader is connected to a desktop or laptop PC, a new smartcard logon option automatically appears, while Group Policy controls enforcement and card removal behaviour (eg locking the workstation automatically). This native Microsoft solution also works in most virtualised and thin client environments, and the same internal PKI-based infrastructure can be used for other applications including email signing and encryption, document signing, intranet security and disk encryption. Additional paid-for software and drivers can further extend this to other operating systems (Linux and OSX) and to integrate with third-party applications (using standard PKCS#11 APIs). The Smartcard Focus logon starter kit has been assembled by our expert team, based on many years of experience helping and supporting our customers through PKI logon implementation projects of all sizes, from 20 users to 20,000. We have included a selection of popular smartcard readers for you to try, plus some of our recommended PKI smartcards. Other makes and models are also available, so if you have any doubts or queries, simply get in touch for further advice. We can also include a 5-user proof of concept license to the Versasec S-Series card management solution, pre-registered to your organisation, completely free of charge. This popular software adds a wide range of useful features and functions to the free tools that are available from Microsoft and Gemalto. The vSEC:CMS can be used to securely issue and manage your smartcards through their entire lifecycle, including handling events such as forgotten PINs and certificate renewals, and offering simple workflows for issuing cards and integrating with other systems. And because we supply this PoC license in a hardware-secured form, you can upgrade to the full solution at any time, without having to re-install the software or recall your cards. We will contact you to agree the license details prior to shipping. 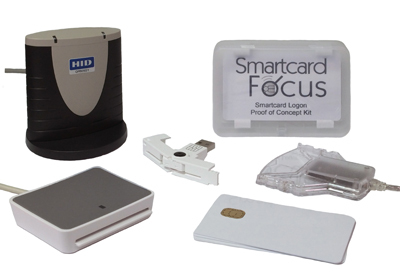 Smartcard Focus also specialises in the supply of hybrid smartcards that include RFID chips for door access purposes. If you wish to combine this functionality on a single card, you can simply purchase additional PKI smartcards that have the appropriate access control chip technology inside, to match your door access control system. If you are considering the implementation of smartcard logon, you may find our in-depth article and guide to PKI-based logon useful. We are also able to offer a custom configuration service, where IDPrime MD cards can be delivered rapidly, with a dedicated admin PIN, custom PIN policy and/or custom Global Platform key if required. Please contact us for more details. Our hybrid smartcard manufacturing service also enables IDPrime MD 830 chips to be embedded into any compatible RFID card body, which can also be printed and programmed as needed. PKI smartcard ideal for highly secure public-key based applications. Includes a built-in contactless HID Prox chip giving the potential for the addition of physical access control applications. FIPS 140-2 Level 3 approved. Full sized USB contact smartcard reader in pocket sized format. Firmware upgradeable. This unique transparent USB contact reader is highly compact and boasts high performance to match. PKI smartcard ideal for highly secure public-key based applications. Includes built-in contactless HID Prox and iClass 32k chips allowing for the addition of physical access control applications. FIPS 140-2 Level 3 approved. Gemalto part O1095606 equivalent. PKI smartcard ideal for highly secure public-key based applications. Includes a built-in contactless MIFARE DESFire 4K EV1 chip giving the potential for the addition of physical access control applications. FIPS 140-2 Level 3 approved. Gemalto part O1095187. PKI smartcard ideal for highly secure public-key based applications. Includes a built-in contactless Paxton Net2 chip giving the potential for the addition of physical access control applications. FIPS 140-2 Level 3 certified. PKI smartcard ideal for highly secure public-key based applications. Includes a built-in contactless MIFARE Classic 4K chip giving the potential for the addition of physical access control applications. FIPS 140-2 Level 3 approved. Gemalto part O1095185. A portable USB SIM-sized smartcard reader. Contact PKI smartcard ideal for highly secure public-key based applications. FIPS 140-2 Level 3 approved. Gemalto part O1094403. PKI smartcard ideal for highly secure public-key based applications. Includes a built-in contactless EM4200 chip giving the potential for the addition of physical access control applications. FIPS 140-2 Level 3 approved. PKI smartcard ideal for highly secure public-key based applications. Includes a built-in contactless EM4200 and MIFARE 1K chips giving the potential for the addition of physical access control applications. FIPS 140-2 Level 3 approved. This popular USB contact reader is known for its great performance and reliability. Stable design for vertical card insertion. Two year warranty. A USB contact smartcard reader with a stylish design.